o The Kills of Kedumba (2008). What's that clearing in the Kedumba Valley? This story answers that question. Small scale agriculture appeared along the fertile edges of the Lower Cox’s River long before the European presence in the high ridge country of the Blue Mountains grew into recognisable towns and villages. 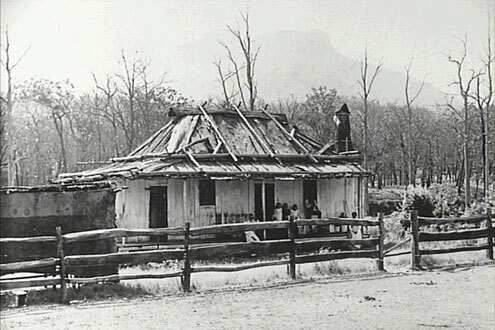 In the wake of cattle thieves and bushrangers, the European settlers moved up through the Burragorang Valley from the early 1820s and when the land along the Lower Cox was taken pushed further into the more isolated and difficult country of the Kedumba Valley. William Maxwell who, with his wife Mary Ann (nee Thompson), established his family at the far end of the Kedumba Valley in the latter half of the 19th century was the son of an assigned convict. His father, Thomas, had arrived in the Burragorang in the 1820s. Though on the map only a few kilometres from the transport corridor along the main ridge of the Blue Mountains, the Maxwell farm was in practical terms a very lonely outpost. Isolation and the problem of access remained major issues for the family and other Kedumba folk, seriously inhibiting their efforts to make more than a meagre living from the produce of the valley. An old Aboriginal path, known as the Bushrangers’ Track (and later the Goat Track), picking its steep and narrow way up the side of the Kings Tableland, was the family’s closest access route to the town of Wentworth Falls. Basically a footpath, packhorses could negotiate it with care and kind weather but, for anything larger, cart or wagon, a long and uncomfortable journey down the valley to Pearce’s Creek, followed by a 40 km climb up the ‘One in Four’ or ‘Jumpback’ Road to the tip of the Tableland, was the only alternative. When Mary Ann died at Wentworth Falls in 1907, she had to be carried home to the valley via this route and then down the length of the Cox to the Catholic cemetery near the Wollondilly. Perhaps, in part at least, in recognition of the difficulties imposed by isolation, William was buried on his own property when he died in 1914. Following his death, William’s son William John Maxwell and his wife Olive took over the management of the farm and while the family depended primarily on cattle during the period between the wars, other avenues were also pursued, if only briefly. Goats and pigs both figured in the life of the family at this time, the former perhaps the source of the alternate name for the Bushrangers’ Track in the 1920s. Pigs raised on the farm were certainly herded up the precipitous path and into Wentworth Falls for shipment to Sydney by rail, though the difficulties involved substantially reduced their profitability. 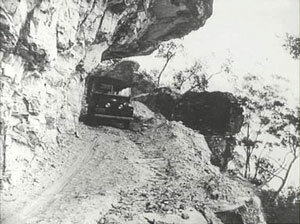 While unsuccessful attempts were made during the 1920s to improve the ‘Jumpback’ track and even to build a completely new road over Pearce’s Mountain, it was not until 1929 that practical attention was finally turned to, in the vicinity of the Goat Track. Work by the Blue Mountains Shire Council now provided the Maxwell family with a much improved bridle path to the top of Kings Tableland. Besides the transport of produce, regular trips up the escarpment were also necessary for the purchase of supplies and for the collection of school material for the boys, Les and Jim, whose lessons were conducted via correspondence. To make the trip easier, William John eventually built a shed at the top of the track, near the Queen Victoria Hospital, where he housed a sulky. 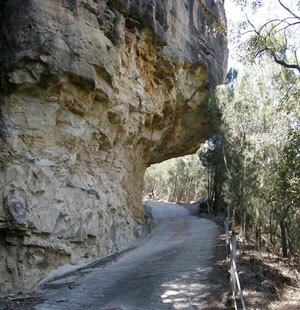 A horse would be led or ridden up and hitched to the sulky for the ride into Wentworth Falls. In 1950, a year before William John’s death, the Maxwell property was sold to the Kedumba Pastoral Company owned by the Cleary brothers of Camden. Les Maxwell stayed on as caretaker for the Pastoral Company and the property eventually passed to the Sydney Water Board in 1992 and then to the Sydney Catchment Authority in 1999. 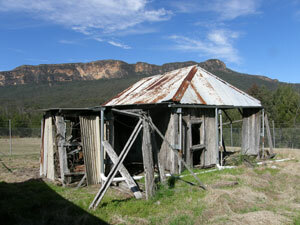 In 2002 the property was absorbed into the Blue Mountains National Park. The farm site, in particular the surviving Maxwell slab hut, is of major heritage significance. And as for the clearing in the Kedumba Valley - it's known as Cleary's Clearing, and is just south of Maxwell's Hut. 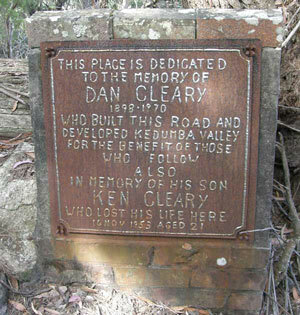 The story above first appeared on the Greater Blue Mountains World Heritage Experience website November, 2010.